An enthralling journey of discovery, and heartbreak. I just wish I could have seen it properly live the first time around. And both versions! All Image Credits: National Theatre Live. Halloween 2014, should I stay in and watch horror movies whilst pretending not to be in and eating all the sweets by myself? Not this year! 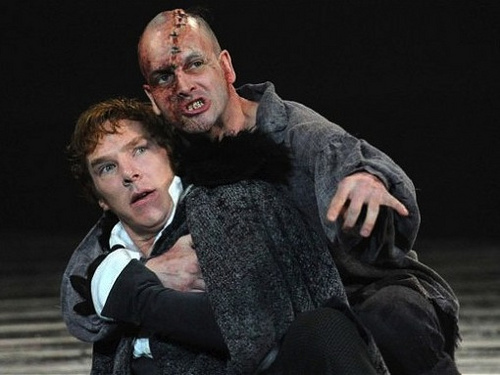 The first time that Frankenstein was broadcast by National Theatre Live in cinema’s and local theatres I completely missed it. And I was gutted! But due to popular demand they brought out an “Encore” Screening, so I was able to see it after all, and in my home town, and I brought my parents along! So I booked tickets online, and on Halloween night wandered down to the local Leighton Buzzard Library Theatre to enjoy the show. 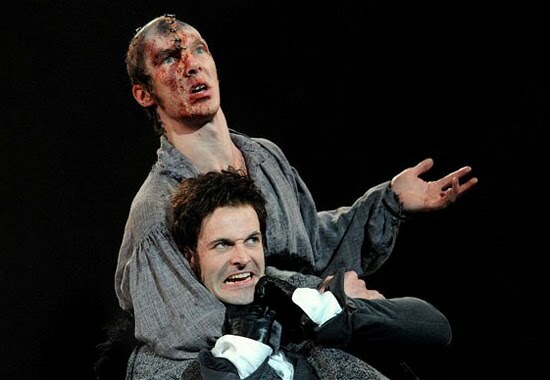 Frankenstein was showing for 2 nights only, and they broadcast both versions, the first night with Jonny Lee Miller as Dr Frankenstein and Benedict Cumberbatch as the monster, and the second night (which was the version I saw) they swapped roles. I did not get to see the Monster-Batch! At first we witness the birth of the monster. And it’s really a birth. It’s painful and confusing. JLM writhes around on the floor, and develops from a newborn, to crawling, to taking his first steps. He’s messy and juvenile, and he has a distracting amount of drool on his chin throughout the whole performance! Immediately rejected by his creator, we follow the monster’s journey to discover the world and learn what it is to be human. Unfortunately for him, he learns how the human race are scared and aggressive towards those who are strange or disfigured. The only person to treat him well is an old blind man, who teaches him to read and write; until he is forced to leave, and he finds his way back to confront his creator. Meanwhile, Dr Frankenstein is driving himself completely insane. Obsessing over his biological work, and the mysterious death of a family member, drive him to experiment in more and more drastic ways. When he again comes face to face with what he has created, he strikes up a bargain to make the monster a female companion. But when Frankenstein goes back on his word, his creation has nothing but vengeance left. With Frankenstein’s upcoming wedding fast approaching, he goes back to his home. Unfortunately, his monster has learned more than he anticipated about people and the way the world works, and destroys Frankenstein’s future. Leaving them both in a continual unending chase to the ends of the world. This production follows the plot of the book more closely than many other film adaptations that I have previously seen. I’ve seen a few, but not all! The childlike quality of the monster is played extremely well, as are the obsessive and manic behaviours of Frankenstein. Having previously read the book (although several years ago), I always felt compassion for the creation, as he was basically a victim. He was the result of a cruel experiment, abandoned at birth, and subsequently treated as an animal by all who meet him. He did not choose the hand that he was dealt. This work of science-fiction-horror by Mary Shelley has always generated discussion over what it is to be human. Do we have the right to experiment with human life? How do we “civilised” humans react to something different? Can we create new life? The answer to the last question is of course “yes” – it’s called procreation, the traditional way. JLM in this production conveyed the tragedy and emotion with such sincerity. BC portrayed the anger, obsession and revulsion to the highest degree and standard. I can only hope that they eventually bring this show out on DVD. I would love to see the actors having reversed the roles, and their different interpretations. Maybe one day. And finally a shout out to the Leighton Buzzard Library Theatre! The staff were extremely helpful and friendly. The theatre was a pleasant environment. And they have a bar! Fantastic. Support your local theatres and facilities everyone! Next Post: Reduce, reuse, recycle at Christmas!